I love to read but in a society where information can be obtained so quickly I am guilty, like i'm sure many of us are, of choosing the quicker option. Blogs, YouTube videos and podcasts have become my first choice for information. This is in no way a bad thing, it's incredible that we have such a vast amount of information at our fingertips. There is however something special, something sacred and something all together different about a powerful book. Below is a list of a few of the books that have reshaped the way I see the world and changed my life for the better. They all follow a theme of spirituality so i thought i'd include a simple definition before we start. I think this was the first book I ever picked up that focused on spirituality. At this point I had no idea what the word 'spirituality' meant or what it could mean within the context of my life. What I did know was that I had grown deeply dissatisfied with life. Externally life was good, I had no reason to feel down, depressed or uneasy but somehow internally I was a mess. Maybe you've felt the same? I've heard people refer to it as a 'hole in the soul'. That feeling of something missing and the inability to fill it, no matter how much you try. The Power Of Now was the start of a journey for me that would allow me to both discover the problem and the solution. 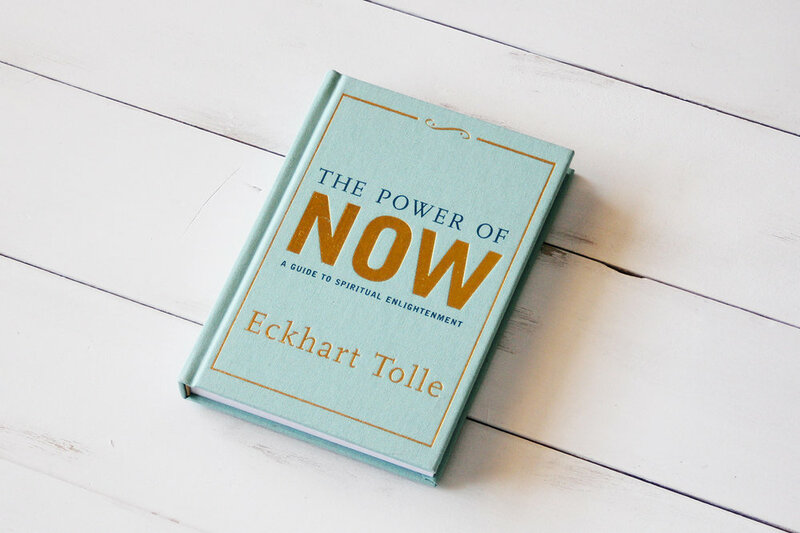 The Power Of Now is a brilliant, life changing book that became my introduction to 'Spirituality' and a 'gateway' book to my new journey. It's also incredibly straight forward and practical. The book simply and effectively opens your eyes to seeing life in a new way and with a new perspective. This isnt to say Eckhart Tolle's ideas are new. They are not. But what he does so well is deliver and explain age old concepts in a way which is easily digestible for our fast paced, short attention spanned generation. I have read and reread the first chapter of this book countless times. It blows my mind every time. I really hope you enjoy it! I struggle to even find the words to explain the power of this book. The copy I grabbed two years ago travels everywhere with me, it is tattered and torn with every page covered in highlighters and scribbled notes. It is a book that I can read over and over and still find something new and powerful in. It is the book where I discovered God, outside of religion and outside my Sunday school misconceptions. (Don't let this bit scare you off - 2/3 of the book is appealing to the most atheist of people!). It is a book which teaches me how to live my life in the moments I am least teachable. Saying that, the first time I read it I hated it. I think it actually took me six or seven attempts to get past the first few chapters. And that only happened as a good friend of mine kept on and on about it's power. Why? This book is not penned with spiritual niceties aimed to make you feel better and inspired. The author, psychologist/psychiatrist Scott Peck, aims for you to confront the very worst of your character and change. Because of that it's not always a comfortable read. It is however powerful and if you manage to get through the first few chapters I guarantee that it can be a life-changing experience. THE BOOK OF JOY: LASTING HAPPINESS IN A CHANGING WORLD - DESMOND TUTU, 14TH DALAI LAMA, DOUGLAS CARLTON ABRAMS. I'm going to keep this one short as the only other blog post we've done so far is on this book. I wasn't going to include it at first but I just couldn't leave it out. I LOVE this book. This book restores my faith in humanity. Desmond Tutu & Dalai Lama transcend both religious dogma and suffering and explore the age old questions of joy through a series of conversations full with truth, laughter and sorrow. The book, in my opinion, is fantastic for a few reasons. Firstly, it gives a beautifully personal insight into these two spiritual giants, away from the crowds of people, busy schedules and non stop demands. Secondly, it really opens your eyes to the suffering both men have dealt with over the years. Once you learn how both men have suffered it gives far more power to the disciplines they have put in place to remain joyful. Finally, the book also shares step by step guides to some of the daily practices both men use that can be implemented in our own lives. So, these are three books that I absolutely love and have 100% helped me on my journey. These may not be the books I hold closest to me now but they will always have a special place in my heart as they came into my life at exactly the right time and allowed me to see the world in a new light, with a new pair of glasses so to speak. I hope you enjoy these and please send in any you think i should read! "You don't need to see different things, but rather see things differently."